Wanna One is a South Korean boy band created through the 2017 cable TV series, Produce 101 Season 2. 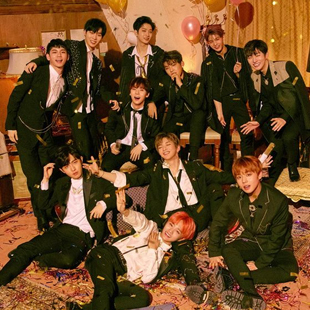 The group consists of eleven members: Kang Daniel, Park Ji-hoon, Lee Dae-hwi, Kim Jae-hwan, Ong Seong-wu, Park Woo-jin, Lai Kuan-lin, Yoon Ji-sung, Hwang Min-hyun, Bae Jin-young and Ha Sung-woon. The group debuted on August 7, 2017 and will be promoting until December 31, 2018 under YMC Entertainment and CJ E&M.